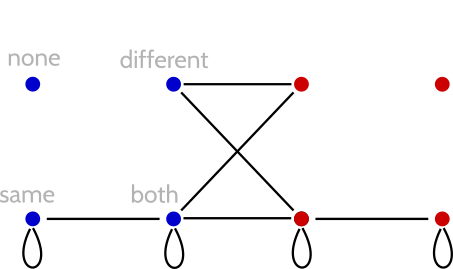 Such a diagram also makes it clear how many degrees of separation there are between different identities—can you see which identities are separated by the longest path? Hint: There are three identity pairs that are maximally separated. 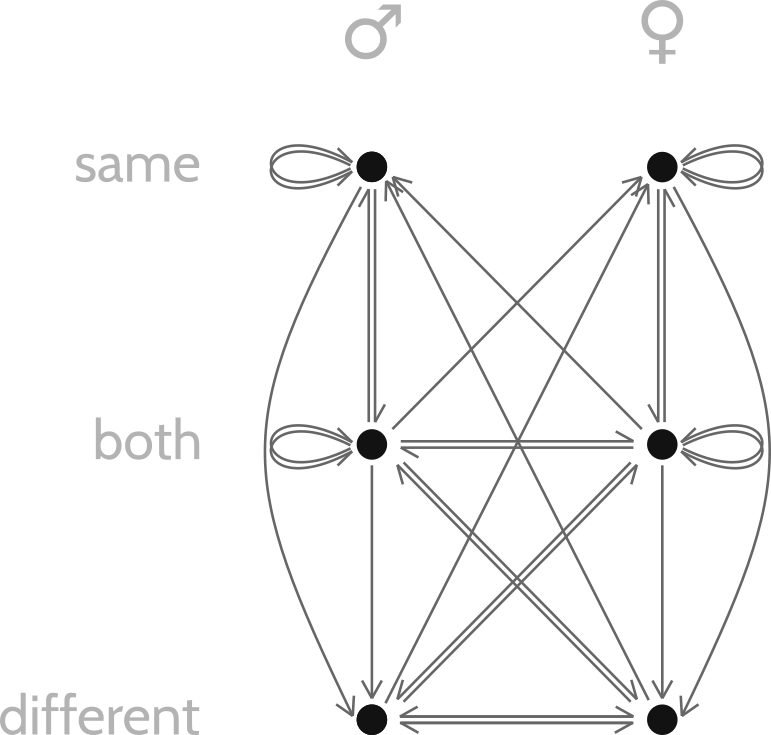 You'd have to form a long chain of relationships to get people with those identity pairs into a relationship-by-transitivity with each other. Also—take heart: No matter what your identity is, two out of three identities you're attracted to are attracted to you in return. 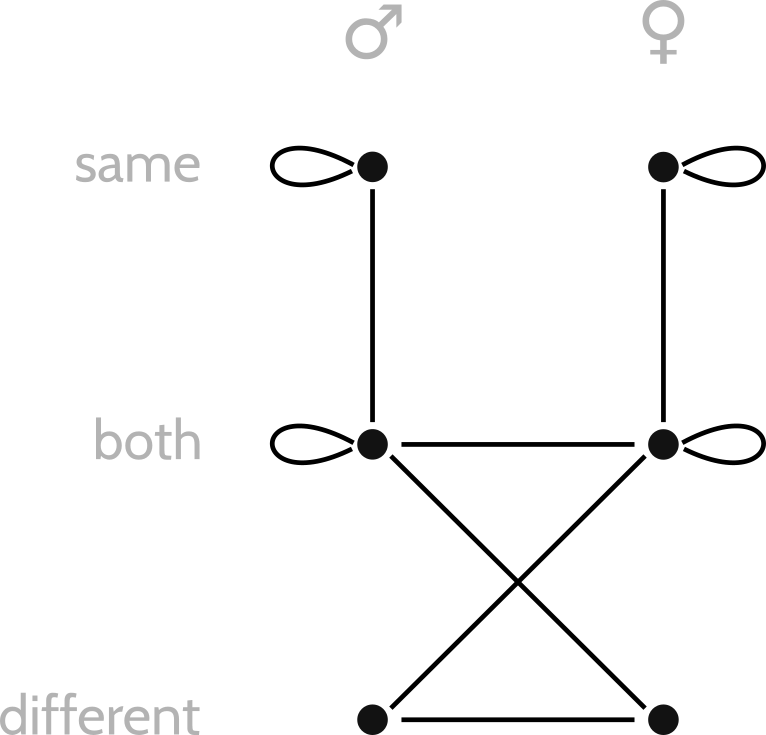 If you like, you can figure out which orientation is which by looking at their connections. Otherwise, here's the complete description. 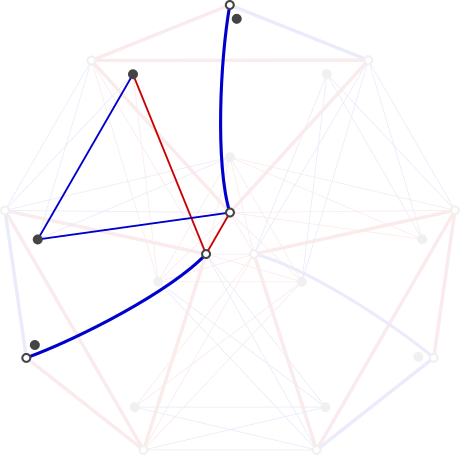 Taking the topmost kite as an example, the orientations—from top to bottom and left to right—are: (1) self-only (white dot at top); (2) no attraction (disconnected black dot); (3) self-or-widders (leftmost white dot); (4) self-or-sunward (rightmost white dot); (5) widders-only (leftmost black dot); (6) sunward-only (rightmost black dot); (7) widders-or-sunward (middle black dot); (8) widders-sunward-self (white dot at bottom). Instead of drawing a loopy edge for own-gender orientations, I use white dots. Edge color and thickness helps you read the graph, but don't otherwise mean anything. 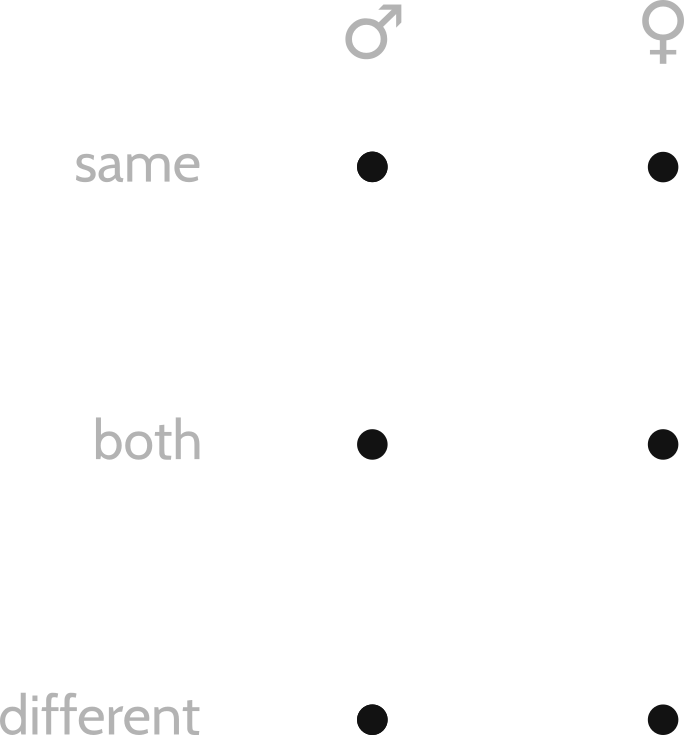 The orientations within each gender form a cube, with each axis direction representing another gender and each face being totally connected with the face of the neighboring cube on that side—you might be able to see it here by imagining that the white dots are raised out of the plane. With the \(G=2\) picture, we didn't include ace identities (identities with no links in the graph). Now that this \(G=3\) picture includes them, we see more reasonably that half the identities you're attracted to are attracted to you in return (regardless of \(G\)).